North Shore Aggregate Inc. was founded in 1985 by brothers, John and Frank Krupp. It was their goal to create a reliable company that offered custom concrete finishes with great customer service at an honest price. More than 30 years later, they still maintain an active role in the day to day operations of the company. This level of experience helps North Shore Aggregate provide an excellent product to its Chicago area customers. 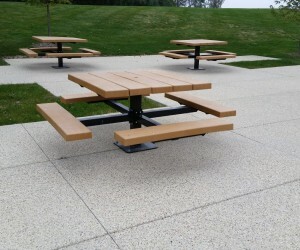 We have been offering custom concrete solutions to our Chicago area customers for over 30 years. This level of expertise allows us to complete our projects on time and on budget. Our team of professionals knows how to proactively and effectively manage all of our job sites. We know that details matter. We strive to make sure that every client’s project vision becomes a reality. While a project underway, we make sure that any deviations from an original plan are discussed with our clients. This open communication is why we are the preferred contractor of many landscape architects and designers. Our quality concrete and exposed aggregate installation process provides a premium final product. From start to finish, we make sure that your project is installed following local building codes and industry standard best practices. We use high strength, high quality concrete mixes from the leading ready-mix concrete supplier in the Chicago area.